When Rathika Ramasamy was studying for a master's degree in business administration, her mind was on something else - roaming through the wilderness, exploring the magnificence of India's diverse wildlife. Born in a village near Theni, in southern Tamil Nadu, Rathika was always fascinated by nature. It was on a trip to Bharatpur Bird Sanctuary in 2003, that her love affair with wildlife photography began. 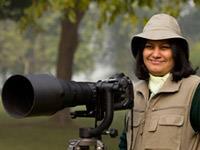 Today, she is famous as one of India's foremost wildlife photographers. In documenting birds through her photographs, she has developed a style of technical excellence that she flawlessly merges with a captivating story. Wildlife photography for her is not only a passion, but also a powerful medium to help conserve nature. Appreciated and featured in several publications and exhibitions, her work has won critical acclaim around the world. In September 2005, Rathika participated in the Clean Ganga Campaign and exhibited her work at the India International Center, New Delhi. In 2007, she worked on a calendar for the prestigious Jawaharlal Nehru University that featured several species of birds found on campus. Not long after, in 2008, she made it to the list of top bird photographers in India by ‘Birds of India’. ‘Uccelli in Natura’, an Italian magazine on birds, selected and featured her as the best bird photographer from Asia, in 2009. In the same year, Doordarshan, India’s public service broadcaster honoured her as the first female wildlife photographer in India and featured her work on their channel. No need to be anonymous anymore. Now you can enter a profile picture of your's and make the world know that it's you and only you who is responsible for all the creativity. Now, we make your work and identity more public and interactive by providing a private URL or public page; making it easy for you to display your art. Tell us how equipped you are. Enlighten us on what Nikon lenses and accessories do you use for photography. Join the community and share your piece of creativity and you never know, the picture you share might become a part of the site and get noticed by thousands of people. So, do you wana get noticed, then keep clicking pictures. Ask Nikon a question ? Now you are able to connect with Nikon School to have your queries answered and if your query seems interesting and enlightening, it might get listed on the site. So, pour in your queries Today!!! Now you can also submit a story, be it about your experience with the lens or a specific photography incident, just enter the topic and a category and share it with us. One more thing to be excited about is, you can add images, as well.